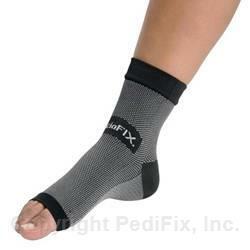 FasciaFix® Plantar Fasciitis Relief Sleeve is a unique, multi-zone compression sleeve with a knitted pattern and subtle ‘nodules’ that help relieve pain and swelling associated with plantar fasciitis. Supports the arch and plantar fascia ligament to help stop heel pain. Promotes healing, enhances circulation and helps minimize the effects of inflammation. Thin enough to be worn under or over socks. Comfortable for all day or all night use. Sizing is approximate and based on Arch Circumference; Small 5"-7.5"; Medium 7.5"-10"; Large 10-12.5"; 12.5"-15". 1 per pack. Grasp the upper part of sleeve and pull on over the ankle until the heel fits comfortably into the heel section of the garment. Hand wash with mild soap, rinse thoroughly and hang to dry. Make sure product is completely dry before reuse. Do not put anklet in washer or dryer. Do not bleach. Do not dry clean. Latex-free. Material Content of Sleeve: 76% Nylon, 24% Spandex construction. If you have diabetes or poor circulation, consult your physician before using. If numbness, discoloration, irritation or additional pain occurs, discontinue use immediately. If symptoms persist, visit a foot specialist.